I waited an hour to see the nurse for a follow-up, only to have her speak to me for less than5 minutes about my labs and diagnosis. I didn't feel she answered my questions and I left feeling frustrated and confused. I waited an hour to see the nurse for a follow-up, only to have her speak to me for less than 5 minutes about my labs and diagnosis. I didn't feelshe answered my questions and I left feeling frustrated and confused. PLEASE ADVISE: You will receive a text message shortly after your appointment is confirmed. We have a 24 hour cancellation policy, so for any changes please call our office immediately. 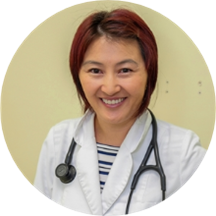 Erdenesuren Jambal is a concerned and caring family nurse practitioner serving the community of Washington, DC. Ms. Jambal attended Georgetown University, where she earned her master's in family nursing. Prior to this, Ms. Jambal spent six years as a registered nurse in DC and Northern Virginia, and four years as an instructor in the certified nurse aide program at Columbia College in Fairfax VA. Ms. Jambal is a part of Medics USA. Patients see her for a variety of reasons, including general consultations, pre-travel checkups, sleep problems, urgent care consultations, and pre-surgery checkups. Because Ms. Jambal is bilingual in English and Mongolian, patients from a variety of backgrounds enjoy having her as their nurse. Ms. Jambal is dedicated to helping patients receive the treatment they need so they can enjoy a positive and fulfilling lifestyle. She has an ability to build a rapport with patients and families. She gives each patient her focused attention, and she prides herself on delivering the best treatment available. first i think it important to tell others i've been going to this office for 5 years and the staff has always been friendly and professional. Ms. Jambal herself has always been both friendly and professional. She listens carefully, ask question,checks your history is very thoughtful before making a diagnosis. I will continue to go here as long as she is working there. She was kind, knowledgeable and listened to what I had to say. She needed to prescribe new medication for me as well as refill medication I was already taking. She researched it before prescribing it. I have a return visit fornext week. I also switched my primary care provider to her office. Front desk staff were terrible. She was extremely rude. One of the worst bedside manners I’ve ever seen in a doctor. Did not care about what was going on with me at all. I highly suggest if you want to be cared for with passion and appreciation then avoid thisdoctor at all costs. Won’t be going back again. good practitioner but the website said it would be a gyn and she is not. This was a mixture of the Doctor and the office, but this was a ridiculous process for urgent care. I didn't even see a doctor until an hour after my appointment was set for. She was incredibly rude and even askedme to do my own internal swab because she didn't have time. I felt bad, because I could tell she was busy, but it was ridiculous. I am not a doctor, and I can't conduct my own tests. She seemed annoyed that she even had to do my exam, and I understand these places overbook their doctors, but I'm still a patient. I will NEVER be going back here again, and certainly not to this doctor. Saw a different doctor, but he was great. Erdenesuren was helpful, consultative and very careful when treating me!